This is a lovely Russian maiden is bundled up in a winter shawl and floral scarf with buckets and a yolk at her feet. She is painted in dark golden tones with metallic highlights and is 7” tall. 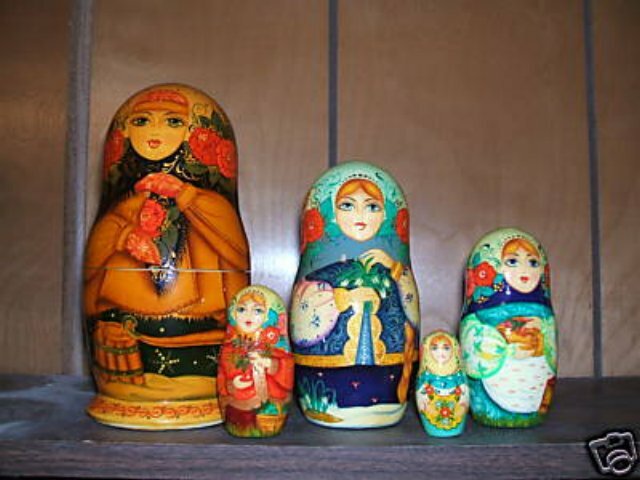 The remaining dolls get lighter, brighter themes as winter turns to spring. The next doll is painted in green tones with snow lilies and a chicken with eggs. The next dolls caries a birch basket of berries and has a basket of mushrooms. The next a basket of green apples and flowers, and finally a yellow doll with bright spring flowers.